I always thought coconut flour (use the code STEWARDSHIP for 10% off at that site!) (use the code STEWARDSHIP for 10% off at that site!) 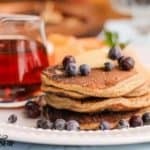 pancakes were bland and boring, until I fixed that problem with these delicious grain-free blueberry pancakes. Super easy, kid-friendly. Prep note: If your coconut oil is solid, melt it. I like to use my metal measuring cup right on my griddle as it preheats so I don’t dirty another pot! In a medium-sized bowl, mix all the ingredients except the coconut oil, coconut flour and blueberries. Heat a cast iron griddle orenameled cast iron pan (or whatever you like to cook pancakes on) over medium heat. Whisk in the melted coconut oil quickly – it tends to solidify when it hangs out with the cold eggs too long. Add the coconut flour, starting with 3 tablespoons. Watch for clumps. Grease your cooking surface with ample fat (coconut oil, tallow or lard are great choices). Ladle out 3-inch pancakes, adding blueberries (or huckleberries, even better!) right into each pancake. Over medium-low or medium heat, cook a minute or so, until bubbles form on top, then flip and cook another 30 seconds or so until brown on the bottom. Avoiding sweeteners? Try with natural applesauce on top. Use a whole (small) banana for a little more sweetness if you’re not going to add maple syrup. It’s just a balance between adding the sweet and not getting a banana pancake, taste-wise. Start with 3 packed tablespoons of coconut flour. If you’d like a bit thicker pancake, go to 4 Tbs. (which is 1/4 cup). Both taste good and don’t get dry! If you’re new to coconut flour, it’s nothing like what you’re used to! Be sure to check out “How to Bake Grain-free with Coconut Flour” for all the tips, why I tell you pack it, and the best prices on the web. If you grab the coconut milk or coconut flour at Vitacost and it’s your first order, you can get $10 off by clicking HERE.